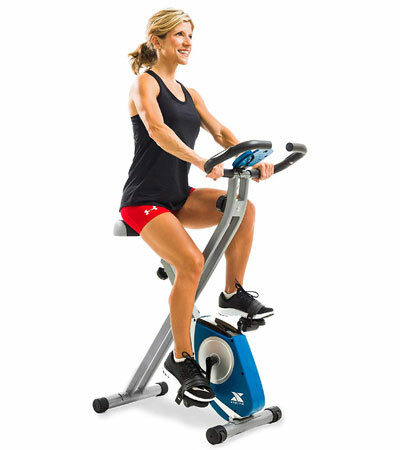 The FB150 is one of the most affordable exercise bikes from Xterra Fitness. It’s a folding upright bike, in the same feature category as the Fitness Reality U2500 and the Exerpeutic 500 XLS. It’s a trainer designed for light cardio workouts. Although it’s a basic bike, there’s a lot to be said about its features, and in this post, we’ll cover each and every one of them. The Xterra Fitness FB150 features a two-piece frame, with an “X” structure, the two pieces being joined at the middle. Although the bike’s frame is made of steel, the whole unit is fairly light; with the fully assembled frame, it weighs only 32 lbs (14.5 kg). On top of that, the front base bar is equipped with a set of small wheels which facilitate the relocation of the unit. This Xterra upright bike isn’t extremely large. With the frame fully assembled, it is approx. 31.5″ (80 cm) long, and 18″ (46 cm) wide, while its highest point is given by the handlebars, reaching approx. 50.5″ (120 cm) above floor level. The frame can also be folded in order to save space; with the frame folded, the unit’s footprint becomes 16.75″D x 18″W (42 x 46 cm). It is recommended, though, to leave at least two feet of clearance on each side of the unit, and at least one foot of clearance at the front and rear, for ease of access and safe operation. The rear base of the bike is a straight bar, not a curved one as for the Fitness Reality U2500. Also, the bike doesn’t have a reinforcement bar for the seat bar, and this is one of the reasons its maximum weight capacity is only 225 lbs (102 kg). The Exerpeutic 500 XLS and the Fitness Reality U2500 bikes that we’ve mentioned have a specified weight capacity of 400 lbs (181 kg). One last aspect to mention here regards the unit’s paint finish. All its metallic parts are coated with a rust-resistant and chip-resistant paint finish. The color used is gray, while the ABS covers of the flywheel and belt are blue. 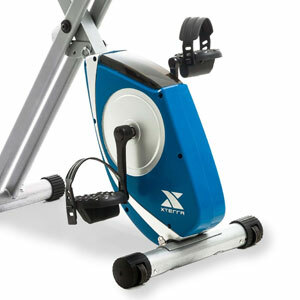 These are the only colors available for this Xterra Fitness exercise bike. The Xterra Fitness FB150 is equipped with an extra large seat. It’s approx. 14″ (35 cm) at its widest point, and therefore, it can accommodate users of all sizes, as long as they don’t exceed the specified maximum user weight capacity of 225 lbs (102 kg). The seat integrates a layer of padding in order to provide optimal comfort. Also, its top is made of a durable, thick vinyl material. In case you’re wondering, the seat doesn’t have the typical collar design like most bike seats. 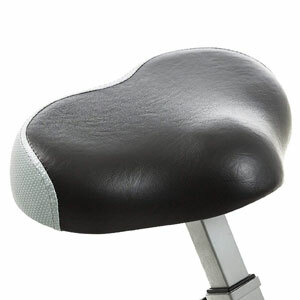 Its post features a triangular plate at the top to which the seat attaches via three bolts. It is not meant to be replaced, but seats with this attachment system are available for sale, so it is not impossible to find a replacement for it in case you want a different type of seat. The seat is only two-way adjustable (up, down). Its post features 7 adjustment positions. Differently put, the bike can accommodate users between 4’10” and 5’10” (147 – 178 cm), promoting a complete leg extension. The bike’s handlebars are non-adjustable. Their metallic, curved bar attaches to the front part of the frame via two bolts. The handlebars have a multi-grip design and they’re covered by a layer of rubber foam material for a secure grip. They also integrate stainless steel pulse sensors so that the console can keep track of your heart rate. 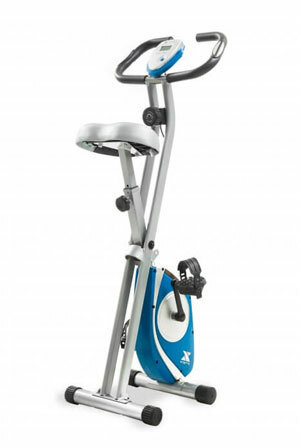 The Xterra Fitness FB150 upright bike features a manual magnetic resistance system. It integrates a small magnetic brake which is attached to the dial at the top of the front part of the frame through a steel wire. By turning the dial clockwise or counterclockwise, the brake’s position in relation to the flywheel changes. This results in an intensity shift of the internal magnetic field which ultimately leads to more or less pedal resistance. Since the bike’s resistance system is exclusively manual, you do not have to connect it to a power source. Also, the console doesn’t play any role in the bike’s resistance adjustment. There are 8 levels of resistance available. The first one is really light, great for recovery training, or warming up. Conversely, the 8th level does provide a distinguishable pedal tension, but it’s still pretty light. Differently put, the bike is not meant for highly intense muscle burning like spin bikes, or heavy-duty upright bikes, such as the Body-Solid B2U. Since the bike features a magnetic resistance system, it has a belt drive system. Therefore, the pedaling motion is very smooth and quiet. Also, the bike doesn’t require any lubrication. The integrated flywheel is very light as well. It only weighs 3.3 lbs (1.5 kg), so it doesn’t provide a highly aggressive inertia or a strong momentum. It’s bi-directional, though. This being said, you can pedal in reverse to put some diversity into your workouts. Also, when pedaling in reverse, the console will continue to track your distance traveled, calories burned, etc. The bike is equipped with a pretty solid, 3-piece crankset, featuring steel crank arms. The included pedals have a metallic core and a durable, non-slip ABS surface. They’re weighted, which means they always turn face-up when you remove your feet from them. They’re also equipped with adjustable straps, so you can secure your feet. And finally, they have standard threads, so you can easily find replacements for them if it is necessary. Since it’s a pretty small bike, the Xterra FB150 also has a narrow Q-Factor (spacing between the pedals). Its exact dimension is not specified, but it should be somewhere between 150-160 mm. This being said, your feet are naturally positioned on the pedals and there isn’t any additional lateral stress on the knees and ankles during pedaling as for bikes with a wider Q-Factor. Like most basic exercise bikes, the Xterra FB150 includes a basic fitness meter. However, other trainers do not include a meter at all, so this accessory is a plus. 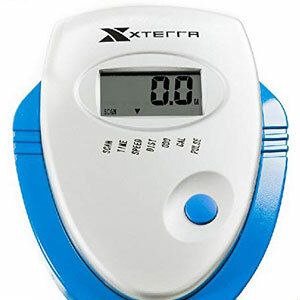 The included meter features an LCD display which indicates speed, distance, total distance (ODO), time, calories burned and pulse. It has a SCAN function that rotates all the fitness metrics, keeping each one on screen for several seconds, but you can also select one of them to view at all time if you want. In order for the unit to track your pulse, you will have to hold onto the pulse sensors integrated into the handlebars. The console is not telemetric. The exercise meter is pretty easy to use. Has only one button. It turns on when you push the button, or when it detects flywheel movement. By selecting the SCAN function, the console will rotate the values showing each one of them for several minutes. However, you can select any of the values to be shown on the display at all time. Finally, the fitness meter is battery powered. It uses two AA batteries which are included. It also has a sleep mode to which will enter after several minutes of inactivity on the bike. The bike’s main frame is pre-assembled, with the flywheel, crank, belt, and resistance system already attached to the frame bar. Therefore, you only need to attach the seat post, the seat, the handlebars, the two bases, the pedals and the console. This shouldn’t take longer than 40-45 min. The manual provides clear assembly instructions and the necessary tools are included. Maintenance doesn’t require much. All the internal components are pre-lubricated from the factory, and since the bike has a belt drive system, it doesn’t require any lubrication. Thus, for maintenance, all you have to do is wipe the dust from the frame and periodically check for loose parts and bolts. The Xterra FB150 is a foldable magnetic upright bike, featuring a quiet belt drive, 8 levels of manual magnetic resistance, and a fitness meter that can track time, distance, total distance, speed, calories, and pulse. 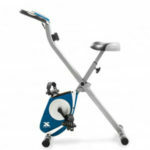 It’s a bike for light cardio training, muscle toning, stamina development and weight loss. You can burn up to 4-500 calories daily on this bike. And finally, it’s an inexpensive fitness machine, offering an excellent value for the price.